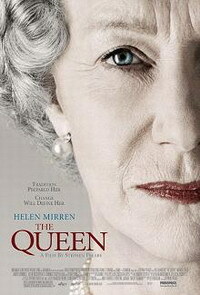 Stephen Frears' The Queen serves privilege and protocol brilliantly chilled. I'm, perhaps, the last blog on the block to see the film; but, as they say, all good things come to those who wait. After tonight's San Francisco Film Society members screening at the Metreon, Stephen Frears dropped by for Q&A. His wryly-timed answers revealed his charming candor and amplified my appreciation and enjoyment of the film. Tim Sika of Celluloid Dreams.Net introduced Frears and moderated the discussion. 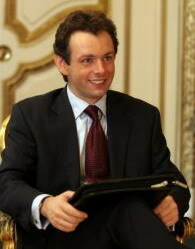 Noting screenwriter Peter Morgan has described Frears as a "writer's director" and adding he's already well-known as "an actors' director", Sika started off the questioning by observing that the film negotiates a fine line between what we know happened and what we imagine happened within the monarchy at the time of Princess Diana's death. He enquired after the screenplay's sources. "You mean you want the phone number of the chamber maid?" Frears quipped. Actually, he continued, Morgan tested initial drafts among people to confirm the story's plausibility. "So, in a sense, he wrote it out of his imagination. You have to understand, if you're British you know a lot about the royal family and you know nothing. "You're a British subject," Sika confirmed. "I'm a British subject," Frears retorted. His audience laughed. "There are shackles on my legs. My knees are worn out from groveling before the Royal Family." Sika wondered if—from Frears' perspective as a British subject—the Royal Family isn't perceived as something of a joke? "It's true," Frears confirmed, "they are made fun of 24 hours a day, yes, and indeed they are ridiculous. It is very hard to take them seriously except they also rule over us. They are there … and they're everywhere. They're semi-divine." "Does Britain really know what it wants from its royals?" Sika queried and Frears answered, "Well, I think we're very sentimental about them. It's a very conservative country too and I don't think there's going to be a revolution or anything. They don't have instincts for republicanism. Like most people you want things to go on in the same way. There's not a great deal of questioning of them but there is a lot of mockery of them. The rather odd thing about this film is it takes them seriously." "Yes it does," Sika agreed and recalled that when he first saw the film—whether because of Helen Mirren's performance, Frears' direction, or Morgan's writing, though most likely a combination of the three—he had feeling for Queen Elizabeth II, which he hadn't thought possible. He was touched by her portrayal in the film. "Is that what you mean by 'odd'?" "I have no idea if we got it right," Frears explained, "For all I know she's very very stupid but we choose to present her as an intelligent woman who realizes the incongruity of her position. Quite simply, there's a contradiction between monarchy and democracy and she has made it work. It's the only time in my lifetime that she's ever been criticized or appeared to get something wrong. But, of course, in getting it wrong, she revealed her humanness." A man from the audience said The Queen reminded him of Jean Renoir's The Rules of the Game. He wondered if Renoir's film had influenced Frears? Frears was clearly flattered. "You always have a film like that in your mind," Frears replied, "and it took place in a large country house and they were killing animals in the middle of it all. I can see the similarity. But, if you're paying me a compliment, thank you very much." Why had Frears made the film, one woman asked. First it appeared as an investigation and then it romantically glossed over who these people truly might be. Why all the contradictions? 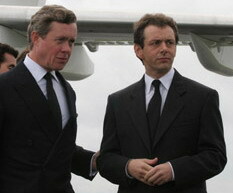 "I made an earlier film about Tony Blair," Frears said, "and the producer came and asked me if I'd be interested in doing a second film about the events in this film with Helen playing the Queen. The truth is, nobody'd ever made a film about the Queen before. If you're British, she and her family and the institution dominate everything in a completely unspoken way. So really what I've made is a film about my country. I figured that people all around the world would be interested in the Queen. It's complicated because it's actually an extremely well-known story so I—certainly in Britain—was making a film in which everyone in the audience knew exactly what I knew, knew as much as I knew, so I guess it's one of the misfortunes of bringing it over here in some ways. There are no surprises in the film. It's full of things that are very very familiar, certainly to a British audience." Sika expressed his surprise to discover a member of the public could rent a cottage at Balmoral and that Peter Morgan took advantage of that when he was writing the screenplay. Frears admitted, "I didn't know that either; but, I guess they're hard up or something." 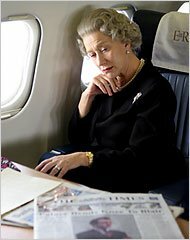 One fellow wondered if, through The Queen, Frears wasn't offering British Prime Minister Tony Blair some advice, especially in the scene where the Queen cautions him about becoming too complacent about being popular with the public, that a time would come when they would turn on him too. "Is that your advice to Tony Blair?" the fellow asked. "That you will fall from grace?" Frears synopsized the question. "Well, I would've given him other advice before I'd give him that. But he wouldn't have taken it because he's not interested. It was particularly galling. The truth is that at that time he'd just won an enormous election and he was enormously popular. He was thought to understand the mood of the country. Now he's enormously unpopular and appears to have completely missed the mood of the country, in ways," Frears smiled, "that I'm sure you understand." His audience laughed knowingly. "So it was a mark of my incredible maturity that I was able to make a film about his good times. Perhaps it was even more cruel to remind him of what might have been?" Frears was asked what the monarchy's reaction was to the film? "Well, the Queen rang me up," he joked, "and she said she didn't like the second reel. I have no idea. They don't tell you these things. I have no idea if she's seen it. I was told that one member of the royal family had seen it but not who it was. You must understand these people are above us. They're not like you. If you cut them, they don't bleed. [Laughter.] They are semi-divine." One woman was struck by how Prince Charles was depicted as emotional and humane, something she would not have associated with him at all. "Well, in a sense, clearly we set out to show them to be human beings as well as members of this historic institution. It is very curious—24 hours a day he looks a complete idiot—but I've actually seen real film of him acting very intelligently." As for his being depicted as "emotional" Frears said, "I would have thought he would have been crucified with guilt and worried about his children so the idea that he wouldn't be emotional, no, he'd be a nervous wreck that week." Was the complimentary portrait of Prince Charles intentional? "You mean, I should be ashamed of myself?" Frears grinned. "It's quite difficult when you make a film about real people, the truth is they're so vulnerable that actually you bend over backwards to find reasons for them and, in fact, it does actually go back to Renoir that everybody has his reasons. So, in a sense, you have to make the film on their side because it's so easy to make them look ridiculous and show them to be dreadful." Another thing Sika learned with regard to the film was that Prince Charles developed a fear for his life after Princess Diana's death. "Well, when he got married to Diana," Frears explained, "they opened supermarkets or whatever it was and he would take one side of the road and she would take the other. Nobody was interested in him. So he'd actually witnessed Diana's popularity. He'd, therefore, also witnessed his own unpopularity. I'm told that story's completely true. In fact, he wrote a note 'In the event of my death….' "
"Is that why the scene was shot from the back?" another person pursued. "Well, you're making a film about restraint," Frears reminded us, "For being someone who [doesn't] show their emotions, it seemed to me it would be somehow intrusive to shove a camera in somebody's face." Sika wondered if Frears had ever given any thought to what would have happened to the monarchy had Diana lived? If she would have impacted it more severely? "The impact, really, had come earlier than that," Frears delineated. "She'd already had this enormous impact just by being modern and liking the movies and Elton John and Versace and things like that. She was such a modern girl. She'd already had that kind of impact. In a way—somebody was saying about trying to hint at other things—I thought the marriage was the really dreadful thing. It's a ridiculous thing to say but I think the marriage was worse than the death. The marriage was just appalling." Having skewered Thatcher in earlier films, and now Blair (though more lightly) in this one, a woman wondered if Frears felt any hope for the British. "There is enormous hope because Blair is going," Frears opined. "It's great. He's going. It's preposterous that he's not in jail, but, he's on the way out so things are looking up. It's very difficult. He was enormously popular then and—though it was tempting to have him say at the end of the film, 'Maybe I'll go and invade Iraq' [laughter]—historically, unlikely." Frears was asked if he'd ever met any member of the Royal Family. No, he stated flatly. "Do you want to?" Sika asked. "No, not for a minute," Frears answered. "People famously go weak, they giggle and become completely foolish in the presence of the Queen. So I'd rather not." One woman was curious about the focus on restraint in The Queen when Frears' previous films—like Dangerous Liaisons—focused so much on passion. "Dangerous Liaisons," Frears reminded her, "was not about the British. [Laughter.] It was a relief, a sort of holiday, a holiday from lack of passion. I did have to behave well and I've always found behaving well rather difficult." Frears was asked if the stag in the movie was a symbol for the Royal Family? Frears responded, "The truth is that in Scotland they cull the deer, they keep the numbers down, because otherwise they destroy the vegetation. The deer they try to kill are the old ones. If you have 14 [points], that means that it's very old. That means it should have been killed. That means it's sort of passed the date that it should have expired, which I guess is a metaphor for …." His trailing silence prompted laughter. Frears was asked what it was like to work with Helen Mirren? "She's just a wonderful actress. The truth is she just got on with the job. No one's ever made a film about the Queen before. It's very very impertinent. In the end, she's up there; I can hide. She was very intelligent about it, very humane, she's just a wonderful actress." 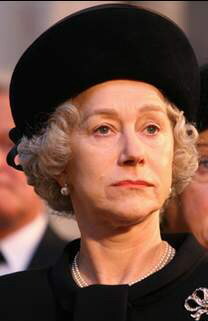 Sika imagined that Mirren must have struggled with the role, that at some point in her process she would have had to. Then again, maybe his actors didn't bare their souls to him? "Well, I couldn't bear to see them if they did," Frears quipped. [Laughter.] "She's very very good. She'd done her homework. I didn't know she was going to look so much like the Queen until one day she came out of the dressing room. I was completely amazed. But, you know, the Queen's been in my life for 60 years so it is someone you're very very familiar with and, at the same time, you know nothing about [her]. So it's quite complicated in that way. But Helen's wonderful, wonderful." Don't worry Michael, you're not the only one behind on this film - I'm hoping to finally catch up with it next week. Oh good, now I don't feel like such a slacker!! Heh. I'll look forward to reading your reactions at Drifting, though the praise has been so unanimous that it's hard to come up with anything new to say about Mirren's exquisite performance. Surely Diana's mental history had much more impact on the Royal family than the film was able to present.